In old days prix ate garden in China were owned by bureaucrats, landlords, rich merchants, and the scholar-gentry. 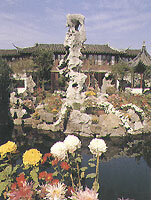 During the Ming and Qing dynasties private gardens were found all over China. In the north most of them were built in Beijing. In the lower Yangtze valley the majority of them were found in Suzhou and Hangzhou. In the south private gardens were mostly in the Lingnan region. But among all the private gardens, those in the lower Yangtze valley were the most typical of Chinese garden culture - the nation's four best known gardens are all situated in this region: Anlanyuan Garden of Haining. Zhanyuan Garden of Nanjing, Lion Grove of Suzhou, and Qinyuan (Jichangyuan) Garden of Wuxi. Most private gardens are in cities. As extensions of dwellings, they are generally small in size, but look elegant and tasteful, and they perform multiple functions such as lodging, get-togethers, study, theatrical performance, and sightseeing. With the limited space of a garden, nature is imitated in a fastidious way. The beauty of natural landscape is condensed and reproduced in the form of artificial mountains and tree groves in a garden that could be visited and watched, and in which harmony is achieved between man and nature. In the meantime, no effort is spared to achieve a poetic grace and satisfy the fancy for a lofty and elegant lifestyle. The better known of Chinese private g, Lit dens MCILOC the Humble Administrator's Garden and the Garden-to-Linger-in in Sl1lhl)n, Ihc G;nden 01 F:ISC of Mind in Wuxi, the Geyuan Garden n Yanglh0n, and Ohc ZlIanynan Garden in Nanjing. The mere mention of the Lower Yangtze Valley evokes memory of private gardens in Hangzhou, Wuxi, Yangzhou, Nanjing, Shanghai and Shaoxing. 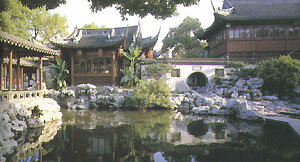 None of these cities, however, matches Suzhou in the number of private gardens. Hence the saying, "The lower Yangtze valley is unmatched for its gardens, whereas of all the cities in the lower Yangtze valley the gardens in Suzhou are the best." After the East Jin Dynasty moved its capital south of the Yangtze River, the economy and culture in this region prospered. This, coupled with a conducive natural environment, set the stage for the flourishing of garden culture. Though some of the gardens gradually sank into oblivion, the number of famous ones was on the increase. Private gardens reached their zenith during the Ming and Qing dynasties. The gardens in the lower Yangtze valley by and large belong to the freehand landscaping school. Most of them are found in cities, occupying areas ranging from a few mu to several dozen mu, and linked with private residences. Their landscaping style is marked by the following salient features: First, most of them are predicated on man-made scenery as the designers maneuvered to put hills and ponds together to recapture the charms of natural landscape. Second, scenic zones and footpaths are ingeniously organized to achieve variations within a limited space; whitewashed walls, latticed windows, rocks of exotic shapes, and long corridors are constructed to partition up the space, so that the views are separated yet organically linked, and greatness is derived from minute detail. Third, buildings in the gardens are as a rule elaborate to the minute detail, and halls and chambers are often furnished with calligraphic works and paintings, objects of art, and finely made furniture. Fourth, couplets and poetic inscriptions are employed to enhance the effect of landscaping, and the poetic grace of the gardens is played up to give wings to imagination and deepen the impression of what's inside the gardens. Fifth, the participation of literati-painters in the designing and construction of gardens has enabled every garden to acquire a distinctive, well-defined theme.